Combines a great range of programming with a proven drive system and includes the premium comfort of a large, 22” x 60” running area supported by our state-of-the-art X-Frame. An extremely popular combination. 2.75 Chp Palladium Motor, a high quality, quiet operating, low rpm motor with proven durability. Bodyguard T270 is great one for you cardio workout that is fitted with latest technologies and is a great machine for loosing weight. Readouts (Designated): Calories, Calories per Hour, Distance, Elapsed Time, Goal %, Heart Rate, Incline, Maximum Heart Rate %, Speed, Target BPM. Readouts (Scrolling): Value Remaining (Time, Distance, Calories), Value Segment (Time, Distance, Calories), Elevation Change, Pace. Readouts (Summary): Average Speed, Calories Burned, Total Distance, Total Exercise Time. A premium console with a wide range of both programming options and features ideal for the average user. The latest cost of Bodyguard T270 Residential Treadmill will be updated soon. *Note: Most of the sites, stores or shopping portals listed above sell Bodyguard T270 Residential Treadmill with discounts and other exciting offers. 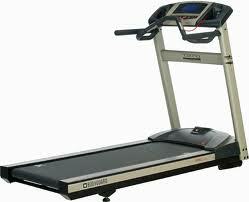 There is a possibility that the some of above websites are not selling Bodyguard T270 Residential Treadmill now. Toughtrain.com is not liable for such cases or instances. Also we do not recommend any seller for Bodyguard T270 Residential Treadmill and a buyer should buy from where he/she gets best deal with quality of products, service and on time delivery (shipment).